Explore our collection of books by subject area. Click on the title to be directed to the ebook or catalog. You will be prompted to log in. Use your 14 digit library card number (located on the back of your student ID) or click on the Online Student Log In link below the entry field to log in using your myLoneStar username and password. Search complete online books. Set up a free account to download to your PC, Mac, Nook, Sony, Android, iPhone, or iPad. Authoritative ebooks in a wide range of subject areas. For more help, see ProQuest's Ebook Central guide. Email, call, chat, or visit us at the Reference Desk with any and all of your information needs. We're happy to help you! Librarians are at multiple locations. 1. Why do I need a library card or ID? And How do I get one? Your LSCS ID serves as your library card and gives you easy access to the library's online resources from off-campus, the Fitness Center on-campus and may help you obtain student discounts from community stores and shops that offer one. For off-campus access to eBooks, articles, and streaming video from the library's databases, use the 14-digit barcode number on the back. You will also use your student ID to add cash to your Print Account so you can copy and print in the library. Go to the circulation desk of any Lone Star College library. You will need a photo ID and you will need to be registered as a student. Of course, we also provide IDs to faculty and staff! If you're an online only student, complete the form at http://www.LoneStar.edu/library/card. 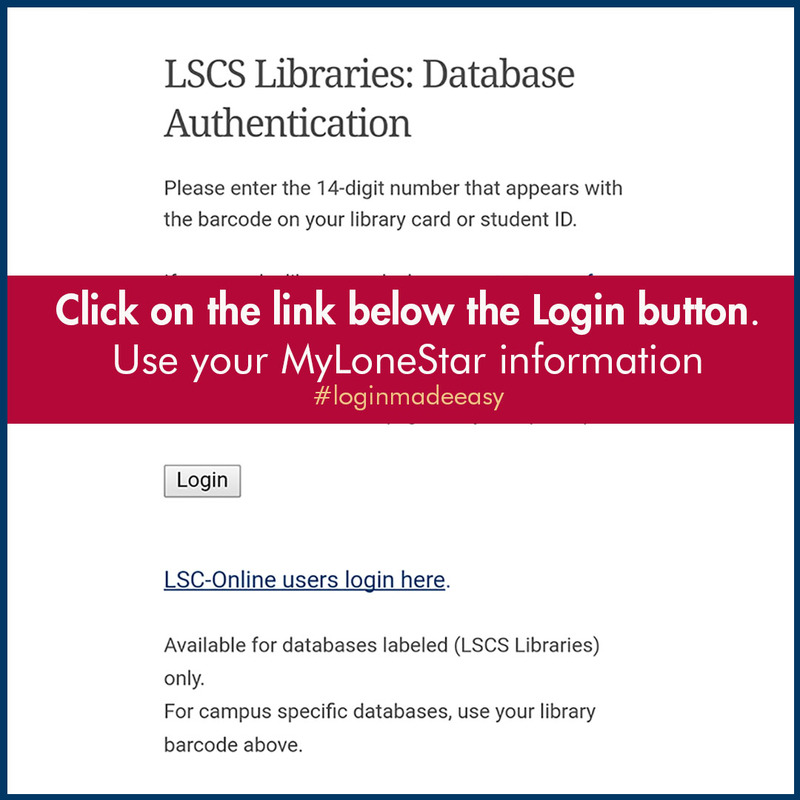 Make sure you use your LoneStar email address, and the library circulation staff will send you a barcode number to access the library's online resources! 2. How do I print or copy in the library? Signing in to any print release station to set up your print account. Use your LSCS ID (issued since June of 2015) to add exact cash at an Add Value station. (Need a new ID? see #1). OR, go to MyPrintCenter and select the Add Funds link to add a minimum of $5 using your debit or credit card or PayPal account. Note: PayPal funds may take a little longer to show up in your account. You will find a link to MyPrintCenter under the Quicklinks in your MyLoneStar portal. 3. Does the library have a group or individual study rooms? 4. What classification system does the Lone Star-Kingwood Library use? In order to find books and other materials in a library, we have to have a way to organize it all to make it easy for you to find. Librarians manage large collections by giving each item an identifier. Think of it like the book's license plate number. We use databases called the catalog to search for these items. Once you have chosen which item you want, you need to find on the page the book's call number. This is the license plate or classification number. This is how you will be able to find it on the shelf. The Lone Star Libraries use the Library of Congress classification system. It was created in the twentieth century to help organize the world's largest collection of material that is housed in Washington D.C. It is alpha-numeric, which means that it uses letters and numbers to help organize all the information into twenty-one broad subject categories. You will find that most academic libraries use this classification system. The great thing about having books well organized is that you'll be able to find more material on the shelves around the book that you went to find. Public libraries and school libraries tend to use the Dewey Decimal system, which only has ten subject classes that simply use numbers. 5. What is the procedure for requesting a book held at another library? In the library's online catalog, you can search for books and other material at all the LSC-Libraries, Harris County, and Montgomery County libraries. Once you find an item that Kingwood does not have, you can request the item by clicking on the Place Hold button on the right-hand side of the screen. A pop-up window will appear and will ask you for your Library Card number and Pin. **Currently Kingwood is not handling books. Please select a local public library or LSC-Atascocita Center for pick up location. Your library card number is the 14 digit number above the long barcode on the back of your student ID (the top set of numbers). Your pin is the last 4 digits of the phone number that you provided when you got your student ID. If you have forgotten it, you may call the Circulation team to see if they can remind you of the number or reset it (281-312-1693). 6. How many items can I check out of the Library at one time? 7. What happens if I have unpaid fines? If a checked out item is overdue, your check out privileges is suspended. You will have a hold on your academic record until the overdue material are returned and fines are cleared. If the item is damaged , lost, or stolen, you will be charged the cost of replacing it. Check with the Learning Center to find out where and when tutoring for writing, math, and other subjects are available throughout the semester.